Towards a new kind of Political Persuasion : On the Offensive not the Defensive. Understanding the ‘Art of Thinking’ and practicing ‘Thinking as an Art ‘ in order to focus your battle strategy, is integral to good political persuasion. CULTURE ON THE OFFENSIVE advocates that the most effective philosophical and political thinking processes, are embedded in Empathy, Clarity and Courage. If we don’t consciously use empathy, we descend into cruelty. In being cruel, we cannot engage effectively with our adversaries. Having empathy is not about pity. It is about being able to put yourself in other people’s shoes and imagining why they think what they think. Someone you vehmently disagree with, can be a good person who you might get on with and learn from. If we don’t consciously use clarity, we descend into confusion. We then become distracted from the core issues. We need to stand back from our arguments and question them ourselves, in order to understand them. If we don’t consciously use courage, we stay in our comfort zone and are vulnerable to attack. New ideas may offend and break current social etiquette, but those risks are worth taking to start new conversations. This enables us to go forward ‘on the offensive’ with new ideas and strategies. We need the courage not just to persuade others to our arguments, but also to possibly change our world views. Consequently, without being mindful of using those three tools to inform our thinking, we may occasionally win arguments in the short term, but we can’t arguably produce sustainable arguments. They do not stand up to scrutiny. It is widely accepted we are living in a climate of political polarisation, where opponents are each engaging in simplistic, black and white, self-righteous thinking and sloganeering. If we want nuanced political thinking, we first have to question extremist attitudes. Extremely simplistic thinking on both sides blocks dialogues that we need to engage in, at a time where notions of Left and Right seem incoherent and in many ways unrecognisable. New political affiliations are emerging, and it is widely agreed that we we need a new kind of political discourse. In order to connect with others and come up with agreements over particular principles and values, we need to be able to persuade others. Our attitudes impact our ability to do this. Our attitudes are a product of our thought processes. In the aftermath of the Brexit Vote, the Trump Vote, and the UK 2017 Teresa May/Conservative loss in the 2017 election, we are seeing a seismic political change. There are many explanations about why this is happening, and we chose to adopt certain of those explanations informed by our particular core beliefs. In other words our explanations and analysis are informed by our particular prejudices. Elections are not just about the leaders of the parties persuading the electorate that their vision for the country is superior to their opponents. Political pundits, strategists, commentators, mainstream media, private and public sector organisations, party members, think-tanks, financial backers, as well as the general electorate, are all engaging on different levels in a battle to persuade you to vote for the issues and vision they believe in. The aftermath of the UK 2017 election battle, ironically, saw the victors, the Conservative Party, lying wailing in the mud of the battlefield. Many of their troops were sacrificed and the rest are still bloodied, battered, and bruised. Meanwhile, their mortal enemies, the defeated Labour Party trot off happily intact across the fresh green meadows. Whose side people took was no doubt decided by a multitude of considerations, and a decision made ‘on balance.’ In the end, the public have to stand up and be counted, based mostly on their support of the best of a flawed bunch. 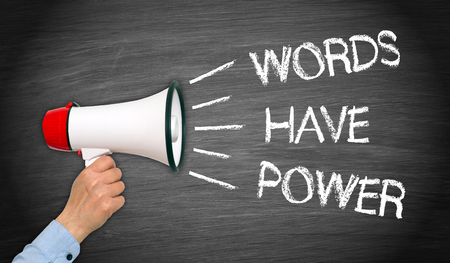 Battles are won by using the most effective weapons and rallying the troops around a shared cause. Political battles are ultimately won by using the most effective weapons of persuasion to change hearts and minds. Essentially it comes down to a choice between an ugly fight or a noble fight. Most fights admittedly have elements of both. When we breakdown the thought processes adopted by the dirty fighters, engaged in the ugly and unethical way of doing politics, we can see they are engaged in thinking that is embedded in cruelty, confusion and cowardice, the complete opposite of empathy, clarity and courage. Winning is more important to them than how they win, and as long as they can get away with what they are doing, they feel vindicated. This happens all over the political spectrum. It is not only done by people we disagree with. We are just more likely to be oblivious to their persuasion techniques if we support the outcome. Aggressively and defensively jumping to conclusions. They adopt the belief that their opponents aren’t just wrong, but also evil. Applying mental filters to their world views and offering explanations as substitutes for arguments. Believing they have some kind of ability to mind read and a right to assume a pose of moral superiority. Predicting the worse and invoking fear in the public, in order to be able to manipulate them more efficiently . Proclaiming that unless we do as they want, everything will be catastrophic. Either under-estimating or over-estimating people. Adopting all or nothing thinking, and giving you’re either with us or against us arguments. Reverting back to the past, as proof that their opponent’s strategies will not work and should be rejected. However, even by adopting these seemingly desperate and defensive weapons, such politicos can still win. Arguably, they can never really enjoy the ‘Glory of the Victory.’ Their arguments are eventually seen through as not being robust, their proponents are not trusted and despised, and it is only a matter of time until they are faced with a humiliating defeat along side an increased array of enemies.. Remember it’s the Noble Victors of any battle, whether it be an actual war or an intellectual and ideological war, that are the ones that are historically revered. Nonetheless, maintaining clear thinking and disengaging from ‘emotional’ reasoning’ that can cloud our judgement and actions is not as easy as it seems. It takes practice in much the same way as mastering any Art. Some people find it easier than others. You can argue that those with that natural gift are the ones who become the important and influential philosophers, political theorists, and even the most inspirational political figures. Those people emerge at times of political unrest and social uncertainty and inspire us in different ways. However underlying any political thought, there needs to be a set of clear moral and ethical principles that you can defend from any possible argument. Human well being should inform our proposed political solutions, especially when we are exploring the emergence of terms within new political conversations. It is not merely about statistics. Its about how these social changes relate to human life. We also need to arm ourselves with the best weapons to identify unhelpful ways of thinking. Emotionally reactive and defensive thought patterns often occur just before and during distressing situations, when we feel we have lost control. The truth is the only thing you have control of is how you think about things. Once you can notice your own thought patterns, then that can help you to challenge or distance yourself from those unjustifiable thoughts, and see any situation in a different and more justifiable way. Self reflection and self knowledge are often confused with self-obsession and narcissistic tendencies. They are not the same. The ability of, “knowing thyself “ is at the heart of enlightened political philosophy, starting from the Greek classical tradition. To know oneself is to be aware of what we are thinking. So what kind of thinking/thought patterns is it good to avoid in order to be effective in coming up with sound political arguments and explanations? The COTO 10 step Guide to effective political persuasion. It is well worth checking or researching if your conclusion is true or not, or your opponents can knock you out in the first round. We have all been party to the “actually, that is not true” response. After that, it is hard to be taken seriously. 2. Identify Mental Filters and Prejudices. When we notice only what our filter allows us to notice, and we dismiss anything that doesn’t ‘fit’ into our rigid belief system, it is like looking through dark blinkers. Anything more realistic is either dismissed, or we make feeble excuses for not taking in evidence that doesn’t conform to our predjudices. This ensures that opportunities for moving things forward are inevitably missed. We may believe we know what others are thinking: we actually don’t. Those are our own thoughts, not theirs. Where’s the evidence of thoughts being a certain way? Is there another, more charitable way of looking at how they see things? If we presume to know what nasty things others are thinking, we can respond in a needlessly defensive or aggressive way, neither of which get you very far, and stifle debate. Perception testing is simple. Sometimes we believe we know what’s going to happen in the future; this is a state of delusion. We can actually only know what is likely. When our predictions are totally wrong (think political polls,) we are plunged into a state of shock. Such a state makes us susceptible to simplistic explanations in order to gain a sense of certainty. Examining how likely things are to actually happen, will avoid the sooth-sayers and ‘doom and gloomers’, as well as the deluded optimists and utopia seekers of political discourse. There are infinite alternative outcomes. 5. Adopt Self-Awareness and Self-Criticism. This does not mean putting ourselves down, but it does mean avoiding automatically blaming others for events or situations that may be partially our responsibility, especially if we tend to rely on hearsay. We cannot assume that because people belong to a particular demographic group that they are all the same. Although most people who really know us may know what we mean, what about our political adversaries? Is their misinterpretation something we may have some responsibility for? If we begin imagining and believing that the worst possible thing will happen, we are in a permanent state of heightened anxiety. We see this within the climate change movement, or after terrorist attacks. Our thoughts jump to apocalyptic scenarios, missing out on the preventative strategies we can adopt, and underestimating human abilities to solve problems. 7. Don’t over-estimate or under-estimate people. If our expectations of humans are way too high, we become unsympathetic and cruel when people don’t meet them. That is the problem with both left-wing and right-wing utopianism. In times of uncertainty, tragedy and shock, as a nation we are more likely to openly demonstrate our emotional reactions than we did in the past. In response to this, there emerges is a climate of demonisation of people who want vulnerability accommodated, or finding a demographic group to blame. Parallel to this there emerges an environment where victimhood is reveered. All people who question an “oppressed ” group’s narrative are simply seen as heartless cold bastards who want to harm people. In response those self identified victims are seen as weak and pathetic, trying to undermine free speech by wanting to silence everything they find offensive. The most humane approach would be to get a balance between accommodating vulnerability, whilst not allowing that accommodation to undermine important public values. And equally we need to stop labelling anyone who challenges us to become more robust and resilient, or questions our explanations as to why things are as they are, as being akin to Hitler. 8. Reject Black and White Thinking. Believing that something or someone can be only good or bad, right or wrong, rather than anything in-between, is a sure way to induce a permanent state of bitterness and anger. A classic example of a seriously bad argument that arises out of this type of thinking, is the ‘either you are with us or against us,’ argument. For instance, if you criticise a minority group in any, the black and white thinker thinks you are therefore totally prejudiced towards them. Think Islamaphobia, homophobia, transphobia, racism, sexism, anti-semite accusations. They are being flung at anyone who dares to want to question oppression nararatives. Feeding on this way of thinking in black and white, comes Identity Politics. We create goodies and baddies, and no-one in between. The goodies are deified and the baddies are demonised and ripped apart if they dare question us. We need to judge people as individuals and by the content of their character and actions, or we become divisive and destroy solidarity. 9. Don’t get stuck in the Past. We all learn from experience, but current situations and events can trigger upsetting memories, leading us to believe that the danger is here and now, rather than in the past. This causes us distress. There are many political events and political leaders that trigger us to believe this is the same situation that lead to a horrendous historical event. If a leader seems in any way authoritarian, it is just a matter of time until they turn into Hitler or Stalin. Even political movements or policies that are similar to those of previous generations, are ujustly described as a reminder of the past. We cannot go back in time – back to the 80’s, or the 30’s. That was then, and this is now. Even though the memory of that period makes us feel upset, it’s not actually happening again right now. Our world is totally different. We can argue that the same principles of a political ideology are being adopted, for example socialism or libertarianism, yet we must be mindful of the fact that any political ideology necessarily adapts itself to the issues and societal structures, economics and values of the present. In the end, we must attempt to stand back from using purely emotional reasoning. The kind of reasoning that says: “If it feels bad it must be bad. It’s making me feel anxious so we must be in danger.” Just because things feel bad, that doesn’t necessary mean they are all that bad. Feelings are just a reaction to thoughts and interpretations of events – and feelings are just automatic brain reflexes. We should always scrutinise them. We may all agree that right now there needs to be a coming together to realign our political notions of Left and Right. We have an incredible opportunity to explore a new kind of politics. That cannot happen if we alienate particular sides of the debate. If political beliefs and ideas are worth their salt, don’t they deserve to be able to be advocated with the best chance possible of persuading others that they are the right way to go! We are all flawed human beings and and ‘loving thine enemy’ is far more powerful than hate. It’s complicated and that’s OK. 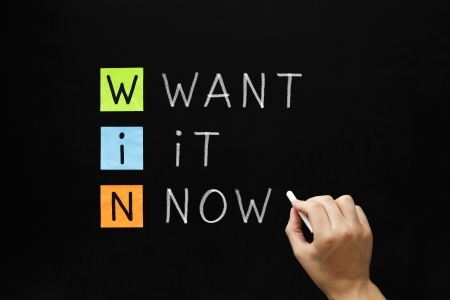 Win – 123RF Stock Photo 21410907 – hand writing want it now with white chalk on blackboard.